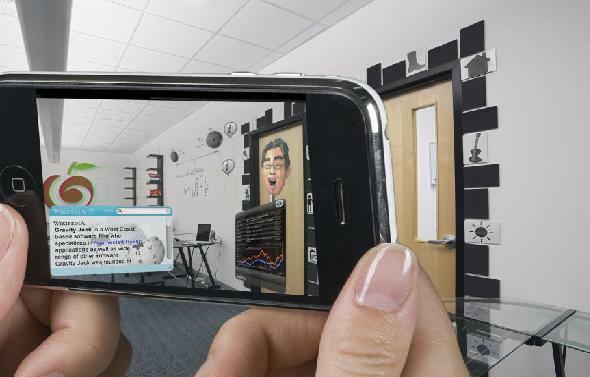 Gravity Jack software firm has created an AR indoor office. I like the idea of populating an indoor space with augments. Personally, I wouldn’t use it for work. I’d rather dork up my writing space at home and show off my favorite LOLcats on the wall next to my computer. Each to his own, I guess. Besides giving me an excuse to put a NASDAQ ticker over the latest Inspirational Poster, Gravity Jack is developing an SDK for their indoor system. IPS – Indoor positioning system, using a patent pending method the phones running our software create a mesh that allows us to position the phone exactly in a Cartesian space indoors. It is almost like walking around with your phone acting like an RFID tag but with coordinates. We also use patented vision techniques to make your phone become the symbol thereby avoiding symbol recognition. Instant Mapping – Utilizing a combination of scene recognition and real time edge detection we can build the real world scene into a 3d wireframe model on the fly. This allows for actually placing 3d objects in the scene and even behind real world objects because we have depth built into our model. AR products today just overlay things on the same front layer. Our technology allows us to place objects in the actual 3d plain. GeoLocation and Proximity Alert – Allows a user to receive push notifications when they are near a SiREAL object and for storage of GeoTags for placing objects in the real world. Asset management server – Our asset management server allows you to upload 3d assets or triggers, symbols associated with those assets and our object recognition will return the correct asset to your application. Stickyness – While not a technical feature – what we have discovered is that by creating augmented reality applications and an engine that allows for true, non gimmick, life enhancing AR; users keep coming back! AR isn’t just a gimmick with us. In summary, we fully support existing technology like symbol recognition, GPS tagging, but have new ways for AR to work indoors, in the dark, socially and we can create stickyness in our AR applications. Not only that, our tech understands what it is looking at and gives depth to scenes – something currently done with expensive dual camera setups.